Name: MYP Community Service Project January 2016 - NAACP "Bridging the Gap"
Our January MYP community service project is working with the NAACP on its “Bridging the Gap” event on Monday, January 18, 2016 from 11:00 AM – 2:00 PM. This event, held at the 13th Avenue Dream Center, has a goal of helping bring law enforcement and our community’s youth together to strengthen relationships. MYP members will help with a number of activities including registration, handing out t-shirts, role playing with the kids, assisting law enforcement volunteers with activities, etc. 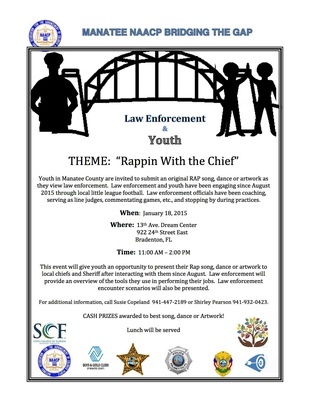 This is a great opportunity to reach young people in our community.